Apple cider vinegar for dandruff is a completely natural “green” product that can do wonders for your hair health. By using this “green” beauty product you will avoid unnatural chemicals on your scalp, and save money at the same time! Apple Cider Vinegar for dandruff is an inexpensive beauty product that you can use if you don’t want to spend much money but still want to look great. Let’s find out how to use apple cider vinegar for dandruff. Try using apple vinegar for dandruff to stop a flaky scalp. Apple cider vinegar is a great natural dandruff treatment, since it stimulates blood circulation in the small capillaries under the skin. It also fights viruses, bacteria, and yeast that may cause dandruff. Apple cider vinegar is able to break down the oily deposits on the skin, where the yeast that causes dandruff feeds, due to its high content of alpha-hydroxyl acids. Apple cider vinegar balances the pH of the scalp, which is important since an improper pH balance on scalp is a major cause of dandruff. If you suffer from severe case of dandruff, use undiluted apple cider vinegar. Massage apple cider vinegar gently into the scalp in circular rubbing motion. Avoid getting getting vinegar in your eyes and ears. Leave it on for about 30-60 minutes before washing it off with a mild shampoo. If you don’t have bad dandruff, use diluted apple cider vinegar and mix one part vinegar with three parts warm water, in the same way as undiluted apple cider vinegar. A great hair mask against dry scalp and hair can be made of apple cider vinegar and olive oil, preferably extra virgin olive oil. A hair mask containing olive oil is especially popular in India where they regularly wrap their hair in olive oil. Olive oil is beneficial for conditioning of hair as well as hair growth. Massage your hair and scalp with the mix of one tablespoon of apple cider vinegar and two table spoons of olive oil. Wrap a towel or foil around your head and wait for about 15-30 minutes. You will find your scalp and hair healthy and balanced. Try it for yourself. It’s easy, inexpensive and 100% natural. 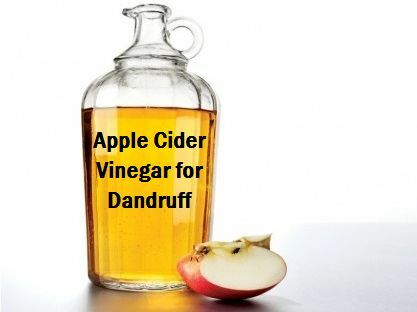 If you have used apple cider vinegar for dandruff please share your experience with us.